It’s not easy to keep up a blog while traveling – especially when you’re exploring the Engadin St Moritz region of Switzerland with a group of travel writers and your time is not your own. 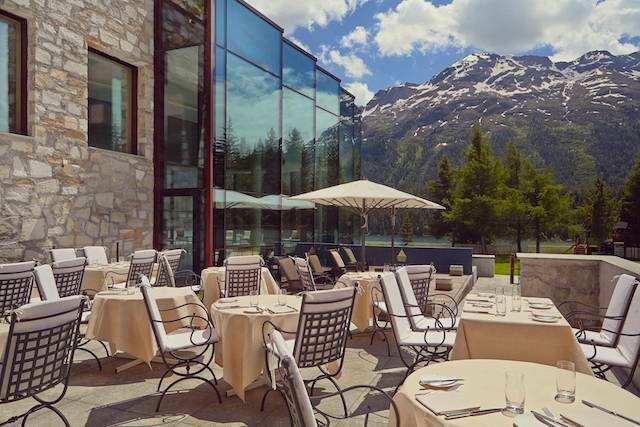 But how could I not pause to blog about St Moritz, Switzerland, the elite of the elite of the ski world and a superb summer destination as well? So here’s your travel guide to St Moritz, the Queen of Switzerland’s alpine resorts, a place of death-defying adventures, slothful indulgence and everything in between. First, where is St Mortiz? 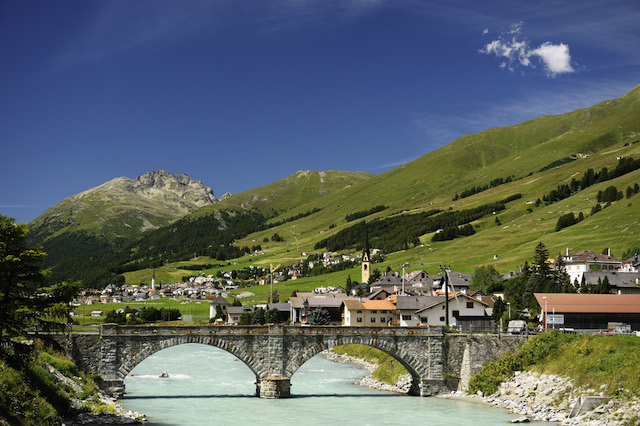 The Engadin St Moritz region is on the southern side of the Swiss Alps about 1800 meters above sea level. St Moritz, that swanky town, is one of 13 towns in the region, and draws aristocrats, playboys, playgirls, tourists and outdoor adventure lovers. 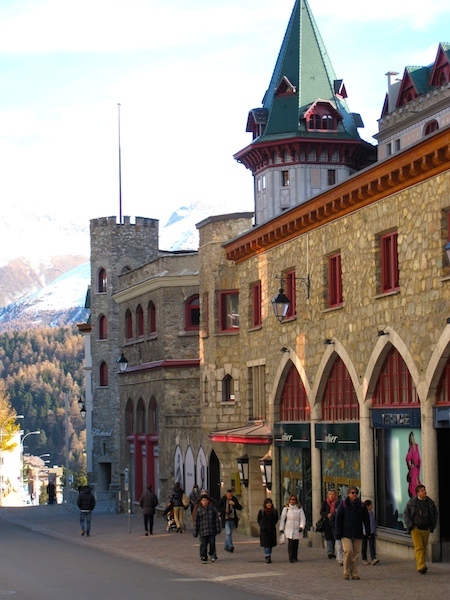 It’s also one of the prettiest towns in Europe, with Lake Moritz at its feet and snowy-peaks all around – yet for all the sparkling bling of alpine ice and jewelry store displays, there is a dangerous side to St Moritz, Switzerland. And I’m going to tell you about it. 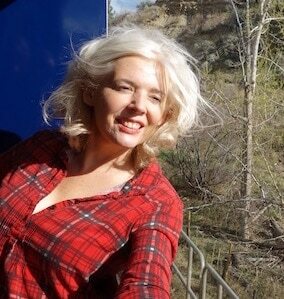 As I said, when you’re blogging on the road, there’s not a lot of time to slow down, but as soon as I saw the highest hot tub in the world, I had my clothes off, bikini on, and was sprinting through the snow and into the Jacuzzi within seconds. If you’re going to slow down, I reasoned, it might as well be in an alpine hot tub with a view. About 20 km from St Moritz, this top-of-the-world Jacuzzi sits on the panoramic terrace of the Diavolezza Mountain Restaurant, which quite fittingly, is located on Diavolezza Mountain (She Devil Mountain). With 6-hour guided glacier treks on Diavolezza and the Via Ferrata (a protected mountain climb with two different routes), adrenalin seekers will find plenty of ways to challenge themselves whatever the season. How this travel blogger challenged herself on Diavolezza Mountain: with a glass of wine, hot steamy water and skyline views of the Bernina Range and Piz Palü, an impressive three-summit massif. It may not seem death defying to you, but I could have stubbed my toe when getting into the Jacuzzi. PS: when you’re done soaking, a waiter brings you a white bathrobe, because in St Moritz, Switzerland, everything is done with style. Champagne and hot tubs! Count me in. The famed St Moritz-Celerina Olympia Bobrun is the only bobsleigh run in the world that still uses natural ice, which means it’s built by hand, which means it’s ever so slightly different every time. Which means it’s unpredictable! St Moritz fast fact: The sport of bobsledding was born in St Moritz and the St Mortiz-Celerina Olympic Bobrun has seen two Olympic Games, in 1928 and 1948. Fancy some thrill-seeking of your own? You can pay to go down the 1.6 km Olympic St Moritz-Celerina Bobsleigh Run with a professional pilot. What? Are you crazy? They’d have to pay me to go. A lot. I suppose for those in a hurry (like travel bloggers on the road) it would be a quick way to sightsee as you swerved down from St Moritz to the village of Celerina, but since I’d be too busy seeing my life flash before my eyes to enjoy the scenery, I’ll give the bobsledding adventure a miss. How this travel blogger challenged herself at the Olympic St Moritz-Celerina Bobsleigh Run: By stuffing herself into a faux bobsleigh car with a mangy mix of travel writers. Death defying indeed. 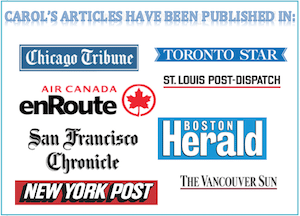 Hippies rejoice! 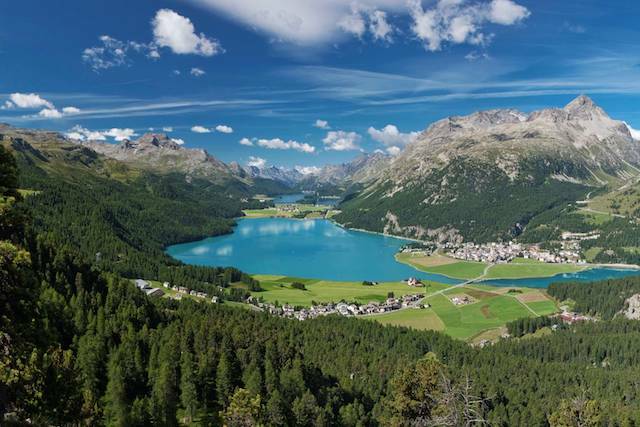 There are four Barefoot Trails in Engadin St Moritz, starting from San Gian, just outside Celerina. Now that’s my kind of adventure. Imagine it, tramping barefoot through meadows, streams and forest. What a way to connect with the landscape. Oh, and barefoot hiking boosts blood circulation in the feet, too. Why can’t I challenge myself on Badrutt’s Palace terrace? The Cresta Run, located near St Moritz’s 13th-century Leaning Tower, is owned by the elite St. Moritz Tobogganing Club and has been tossing daredevil tobogganers off its back for more than a century. Reportedly, the 1.2 km Cresta Run has killed four men and broken enough bones to build an extra alp, taking the sport of tobogganing to the extreme. And in a distinct show of chauvinism, women are only allowed to risk their own bones once a year – during Ladies Day on the last day of the winter season. Newsflash – Travel blogging does not include risking my life: The chances of me ever trying the Cresta Run are nil, Ladies Day or not. Speed demons can check their speed-skiing skills on the High-Speed Slope on Corviglia, a ski slope just above St Moritz, where ski times are shown on digital display. Now we’ll see who’s all talk. Me? I’ll stick to the Chilling Out Slope, which according to my St Moritz Engadin travel brochure, says that going slow is the latest trend and that a dedicated slope on Corviglia Mountain belongs “solely to the idlers who prefer to ride leisurely.” It all goes to prove I’m not lazy. I’m a trendsetter. Corviglia might be a ski haven in winter, but in summer it’s for mountain bikers and the new Corviglia Flowtrail is ‘a flowing downhill pump track’ (I don’t actually understand what that means but it sounds very fun) that leads from Corviglia down to Chantarella Station. Bonus: The Corviglia Flowtrail is a family adventure so you’ll likely leave with all limbs intact. How this particular travel blogger would like to challenge herself on Corviglia: by hiking the Heidi Flower Trail. That’s right, folks. My kind of sport is a happy hike amidst the wildflowers along the 1 km long Heidi Flower Trail that leads from Chantarella down to the Heidi hut and beyond. (Yes, this is Heidi country!) It’s the perfect time to hike slow and smell the roses, or at least some of the 200 other Alpine plants on the trail. Give me a renewing hike over death defying anytime. Now that we’ve discussed all the death and non-death defying adventures you can have in Engadin St Moritz, let’s get to some St Moritz travel tips. 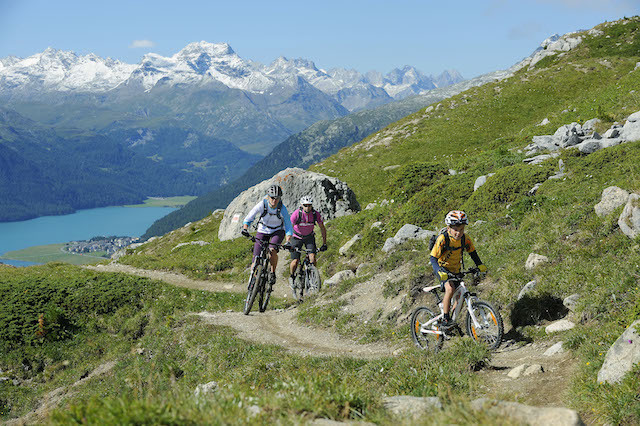 You don’t have to be outdoorsy to love St Moritz. That’s why Badrutt’s Palace Hotel, a Belle Époque beauty built it 1896, plays such an important role in town. It’s perfect for posing around in, which is why I want to stay here even more than I want to hike the Heidi Trail. 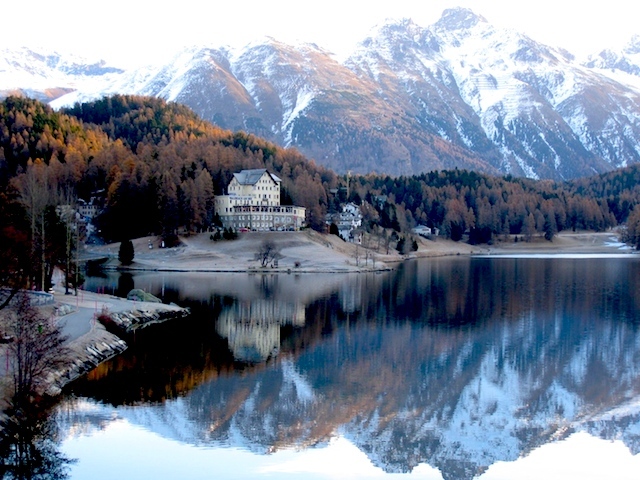 Bonus eco-luxury Badrutt’s Palace fact: Badrutt’s Palace uses an innovative heating system that extracts heat from Lake St. Moritz, which supplies 80% of the hotel’s energy requirements. Kudos to you, you big old luxury hotel, you! Important blogging-from-the-road-St-Moritz gossip: Alfred Hitchcock, a Badrutt’s Palace regular, never did anything sporty at all. He probably didn’t even hike the Heidi Flower Trail. Located on Lake Moritz, the 3-star Waldhaus Am See hotel was built in 1885 and is cozy, clean and excellent value. Also, it’s a hotel with a view. If you’re craving caviar and truffles or something equally divine, make your way to the swanky La Marmite restaurant, reached by funicular from St Moritz townsite. Good luck getting into the famous Dracula Ghost Rider Club – It’s a private club and restaurant and you may not get past the doorman. 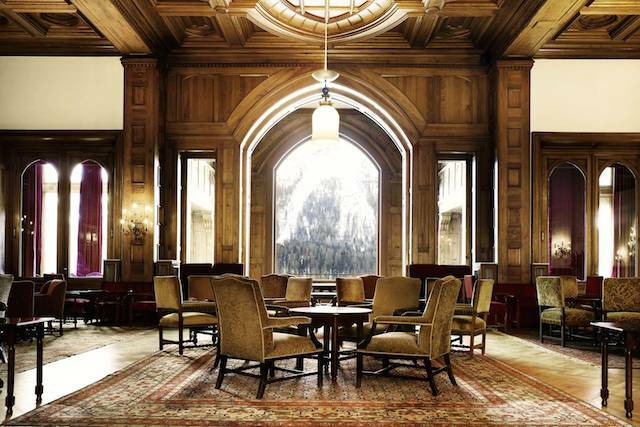 I counted myself lucky just to be able to tour these hallowed rooms when it was closed. Only, once I got in, the Dracula Ghost Rider Club didn’t look hallowed after all. Instead of the gilt ceilings and crystal chandeliers I was expecting, it looked more like Dracula’s frat house with Dracula insignia and bat emblems. Important blogging-from-the-road-St-Moritz gossip: When parties at the Dracula Ghost Rider Club get wild, and aristocratic high jinx are in full force, revellers have been known to bring a coffin up from the basement and ride it down the bobsleigh run. Convenient, really, in case you crash and fail to defy death after all. Folks: Don’t try this at home. Leave your coffins in the basement where they belong. Don’t worry. If you can’t get into the Dracula Ghost Rider Club, the cozy Devil’s Place bar in the Waldhaus Am See Hotel just steps below the St Moritiz offers the largest selection of whisky in Switzerland. What I liked: a peaty-toned whisky from Islay. And now that I’ve paused to give you a glimpse into the celebrated town of St Moritz, it’s time to get back to blogging on the road. Hey, this is great writing, thanks for some laughs and information! Thanks for the tip on Waldhaus Am See hotel. 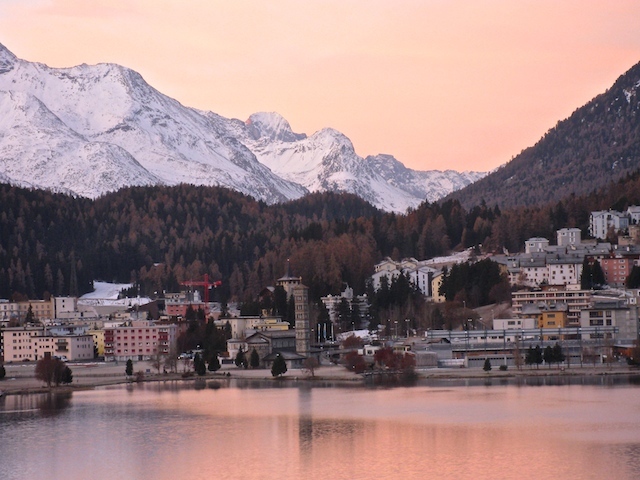 It looks gorgeous in St. Moritz so a room with a luxe view at a bargain price sounds like a great deal. Loved this post Carol, really informative and I never knew there were barefoot walking trails in St Moritz!